FeedExact takes the hard work and day-to-day management out of marketing your products on comparison shopping engines (CSEs) and affiliate programs across the web. These channels represent tremendous sales opportunities for Miva Merchant businesses; in fact, shoppers in 2009 turned to comparison shopping engines 13% more than previous years, according to a study by Yeoman Technology Group. FeedExact formats your data & provides it to each CSE in the right format. Each CSE has its own data feed format and method of sending your product information to its system, which makes managing your data on these marketing channels difficult. FeedExact simplifies that process by taking a single data feed from your store and formatting it properly according to each CSE's requirements. FeedExact also maintains the data and keeps everything in sync with your store in a pre-determined schedule. Certain CSEs perform better for some merchants than others, and even on a given CSE, some products bring a higher return on investment. FeedExact's reports and analytics help you determine where to invest your marketing dollars for the highest return. Performance reports help you bring in the most sales dollars. 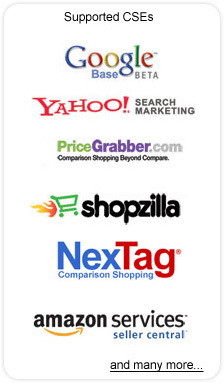 Sign up today for a free trial and see how FeedExact simplifies your comparison shopping engine marketing initiatives.